Cape Town - Upset the applecart? The Stormers did a whole lot more than that on Friday ... they sent it tumbling off a cliff edge, shattering it into a million pieces of shrapnel. Simply, so much about their 41-24 humbling of the Rebels in their own Melbourne den was, exhilaratingly for the most part, unexpected. Just for starters, they'd entered the game with a patchwork, rookie-laden team (with a first-time skipper in Steven Kitshoff, too) considering the wave of core-staff absenteeism through injury, Springbok-related rotation or unavailability for other reasons. They were also playing the Australian conference-toppers, who would hardly have been without fair homework on their foes as their head coach Dave Wessels is a Capetonian who knows plenty about the Stormers culture and their masterminds. But there were additional reasons for not exactly being inclined beforehand to bet your SuperBru house (I didn't, and my consolation is that I ought not to be alone) on an away victory in this one. If you were going to learn that the try count in the frenetic clash would be 5-3, for example, your initial reaction might have been surprise that the Stormers managed as many as three ... never mind Robbie Fleck's charges instead being architects of the five. But that's precisely what occurred, in a development that violently bucked their 2019 trend in that department: lowest scorers tournament-wide with only 11 from seven outings previously, so this was a genuinely drought-breaking occasion. This was also their fourth tour game after a nought-from-three earlier portion of the Australasian trek, and it is more customarily the perilous juncture where South African teams - especially if the trip has already seemed long, hard and been largely fruitless - suffer one-foot-on-the-plane syndrome and succumb with a whimper in the closing fixture. What's more, the "second 40" of game four can be a special heart-breaker, the dam wall all too often bursting after only creaking before the change-over. Instead these Stormers heroes - they truly were that, pretty much to a man - remarkably posted 31 points after the break in this contest, including four of their visits behind the whitewash. It was a triumph of sheer doggedness and tenacity, the foundations laid through a steely, near-unrelenting energy and often fantastic line-speed on defence which rattled the Rebels off their attacking stride and forced a plethora of turnovers and opportunities for counter-attacks. 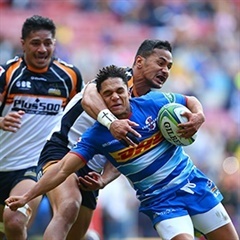 Pinned to their own territory for lengthy portions of the encounter, the Stormers apparently made 139 of the 179 tackles ... almost 78 percent. But in a match which provided ample manna for those who earnestly believe rugby tussles between well-matched foes are often best won by NOT having possession and instead disturbing defiant defensive integrity by stealing the "pill" and backing your speed and composure against the flow, the visitors showed some long overdue sparkle in the process as well. Dillyn Leyds was central to much that was constructive about the Stormers, the slim athlete - you could have made the Afrikaans meaning of "slim" just as applicable, too - dotting their first try and then being an influential figure in the build-up to each of at least the next two as well. But there was also the consistent alertness and opportunism of outside centre and former SA Sevens star Ruhan Nel to celebrate; he had his best game of what had hitherto been a shaky personal season thus far, notching two tries and only being deprived of a third because of a video play-back to an earlier part of the leadup confirming that Sergeal Petersen had just put a foot on the touchline. Midfield partner Damian de Allende, quite possibly aware of the mounting threat to his Bok No 12 status from Andre Esterhuizen and possibly others, can also look back on this stirring occasion with pride; he looked much more dangerous with ball in hand again and was busy over the ball at breakdowns. Although the lineout still leaned toward messiness (not too surprising when such surnames as Etzebeth, Schickerling and Du Toit are missing), the Stormers pack functioned cohesively as an industrious unit, the likes of Bongi Mbonambi, Kobus van Dyk and Jaco Coetzee (before what looked like a bad knee injury to the No 8 marauder) making vast amounts of ground on the scramble and hitting collisions with gusto. brought to an abrupt halt a mounting reputation for fallibility away from Newlands - they went in with a wretched 1/13 most recent record from matches beyond the shadow of Table Mountain. Consider also that the Capetonians only sported two home fixtures among the first eight; they now go over the "hump" with six from eight to look forward to in their stronghold.